The Review of African Political Economy supports the boycott of the University of London central administration. The boycott is part of the campaign of outsourced workers in the union, the Independent Workers of Great Britain (IWGB), for the same treatment as their directly employed colleagues. The boycott will continue until these workers are made direct employees of the University of London on equal terms and conditions with other directly employed staff. Currently outsourced cleaners, receptionists, security officers, catering staff and porters at the University of London central administration suffer from far worse terms and conditions. This means they receive worse sick pay, holiday pay, maternity pay and pension contributions than their colleagues for no other reason than they are outsourced. Outsourcing is a key pillar of neoliberalism and it has devastated working conditions in public services and universities across the world. In Africa such practices have been part of the long-running restructuring of economies and states. Yet, the continent has also been at the cutting edge of campaigns against outsourcing. In South Africa, for example, in recent years the campaigns to decolonise higher education, end privatisation and scrap fees have also demanded and secured an end to outsourcing (see here). We call on our readers and supporters to boycott all events organised at Senate House, University of London, support the campaign and sign the petition (please click on the link here). For years outsourced workers at the university have campaigned, demonstrated and taken strike action against bullying, lies and repression. Outsourced workers are much more likely to suffer from discrimination, bullying and harassment than directly employed workers. 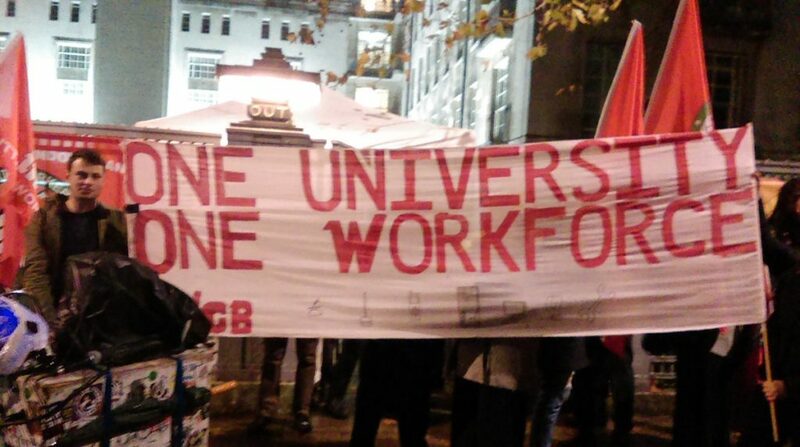 For example, the IWGB dealt with 54 complaints from outsourced workers at the University of London in 2017, over issues including unlawful deduction of wages, discrimination and failure to provide a statement of particulars. In the same period of time it dealt with only two complaints from direct employees. Outsourced workers have repeatedly been on strike and the university still refuses to sit down and negotiate with them. After initially committing to end outsourcing, the university has since gone back on its commitment and said that cleaners will remain outsourced until 2020 and catering until 2021, when in-house options will be presented alongside other commercial bids. Outsourced workers continue to live under a regime of bullying and with managers that are not held to account. In June 2018 the IWGB revealed that a senior manager for outsourcing company Cordant that had previously assaulted a migrant worker was a supporter of the far right. In October, the IWGB revealed that outsourcing company Cordant and the university failed to remove a Cordant manager after three separate women brought complaints of sexism and homophobia against him. Two of these women continue to be managed by the culprit. The University is responding to legitimate industrial action by the workers by hiking up security. The Guardian reported in June that just two months of heightened security cost the university almost half a million pounds. In the last strike on 30 October the University used bailiffs with handcuffs and extendable batons in a clear attempt to intimidate workers and protesters. What, you might ask, has the boycott by outsource workers of the University of London central administration, to do with readers of the Review of African Political Economy? International solidarity, is the brief answer. Outsourcing is a key pillar of neo-liberalism and it has devastated working conditions in public services and universities across the world, as the call for support points out. This will be familiar to readers from many countries across Africa. It is also the case that the struggle against various forms of neo-liberalism, including attempts to keep wages low and even cut them to the bone, by government and private enterprise alike has been waged across the continent, from South Africa to Nigeria to Egypt in recent years. Those who might like to read about such international links and the struggles around the defence of workers and indeed human rights in Britain and in Africa, should read ROAPE’s web manager Leo Zeilig’s ‘An Ounce of Practice’, reviewed positively by ROAPE contributor Heike Becker in ‘Revolutionary Socialism in the 21st Century’ (RS21) online on 4 May 2017 in which she remarks that Zeilig ‘has drawn inspiration from two seemingly unconnected social and political struggles’ – in London and in Harare.